Last week we started Whole 30. While I’m a skeptic at best when it comes to fad diets and extreme eating methods, this was a long time coming. No one starts Whole30 just for fun. Although the financial implications of a paleo diet for a family of 5 are intimidating, a handful of circumstances prompted this step. One of my kids is chronically ill. It’s nothing dangerous, but it’s one of those things where an ultra-clean diet could be a game changer. A few years ago, my husband was hit by a truck. The following onslaught of traumatic surgeries and antibiotics did a number on him (all of us – let’s be honest). His gut health could use some TLC. I have migraines all.of.the.time. It’s something I need to explore (hormones? magnesium? nightshades? ), and cleaning up my diet is a good first step. The laundry list: gluten intolerance, dairy issues, IBS, eczema. All minor, but if a clean diet can help, it’s worth a try. Honestly, it seemed like the simplest first step towards gut healing. There are all sorts of ideas out there, each one more intimidating than the last. Whole 30 has a fairly simple premise: Eat veggies, fruits, and clean protein. Feel better. Then figure what’s making you feel sick. Here’s the thing: we are a family of 5. We eat a lot of food. If our finances are going to survive a Whole30, we need to be really frugal. Since I’ve been cooking real food for 10+ years, it’s time to put it all to the test. Normally, our grocery budget hovers around what we would receive if we were on food stamps. This feels extremely generous compared to our early grocery budgets. By using frugal, real food principles, we get to eat a lot of organics and sustainable foods. So we feel comfortable with this amount, even though it sits under the national average for a thrifty food budget. Whole30 will change some of that. We prepared for it to increase our current budget. 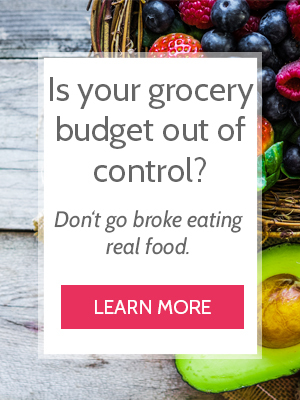 However, we’re determined to use every method possible to keep our budget within the average US grocery budget. My goal is to challenge myself to tackle important things like gut healing and food allergies without spending an exorbitant amount of money. We’ve been doing it with real food and organics, so why not apply it here? Will it be more expensive? Yes. I’m still reeling from the sticker shock from our last grocery trip. But so is being sick. We’ll adjust our budget and do our best because our health is a high priority. Almost all organic/grass-fed, clean meat – we’ll use these methods to save big. 50/50 organic produce – I try to buy the Dirty Dozen all organic. But I’m not legalistic. Farm fresh eggs (mostly) – I have a friend who sells the best eggs you can buy – non-GMO fed hens, free-ranging (seriously – my kids can go to her house and play tag with the chickens). I don’t get a friend discount though, so don’t think I’m coming in with an advantage 😜. I will buy regular eggs for hard boiled eggs. That just works better for us. Follow the Whole30 Program Rules – no grains, no dairy, no sugar, no soy, etc. Keep the people fed – Everyone in our family has a really fast metabolism. It’s a blessing and a curse. Our kids are all under age 10 and already eat like teenagers. Honestly, I don’t know if we’ll be able to do Whole30 on an average grocery budget. But that’s the whole point of this experiment: to see if we can. Whole chickens – The cheapest way to purchase organic chicken, and you can use it for the meal below. Soup – Homemade bone broth + veggies + potatoes + seasoning = soup for pennies. Bulk meat – We purchased 50 pounds of local grass-fed ground beef from our favorite beef farmer. This will provide most if not all of our red meat for the next 30 days (and hopefully longer – we should NOT eat 50 pounds of beef in 30 days). Aldi – Produce and almond milk. That’s basically everything that will be in my cart. Shop the sales – We’ll stock up on whatever vegetables and fruit are on sale at Aldi, then supplement with their frugal staples. Potatoes – Sweet potatoes and regular potatoes will provide the bulk of our starchy foods. Thankfully they are dirt cheap at Aldi. That’s the plan. While I’m writing this, we’re about to start week 2, and so far these methods REALLY WORK. Maybe you want to help your family eat healthier or you need to accommodate food allergies. You don’t have to break the bank. You CAN eat healthier and save money. If you’re considering doing a Whole30, but you need to do it on a budget, let’s see if we can do it.